The Whole Truth is a 2016 American thriller film directed by Courtney Hunt and written by Nicholas Kazan. 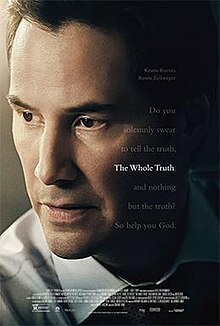 The film stars Keanu Reeves, Gabriel Basso, Gugu Mbatha-Raw, Renée Zellweger, and Jim Belushi. The film was released on October 21, 2016. Defense attorney Richard Ramsay works on a tough case to defend 17-year-old Mike Lassiter, who is suspected of murdering his wealthy lawyer father Boone Lassiter. Ramsay is a very good friend of the Lassiter family, having worked with Boone for many years, and is trying hard to save Mike from being sentenced for murder. Despite this, Mike shows cold hostility to Ramsay, and remains mostly quiet during the trial, which makes Ramsay's job as defense attorney harder. Ramsay enlists the help of a young lawyer Janelle as his assistant, who is determined to find out the truth about what happened. The witnesses are called to testify details of the case; the first witness, a flight attendant, states that Mike and Boone had a serious argument in-flight when Boone insisted that Mike study law at Stanford. The police officer who first responded to the call testifies that at the scene of the crime, Mike muttered that he did it, and only his fingerprints were found on the knife used to kill Boone. As Mike refuses to talk to Ramsay, he is unable to present his defense. The Lassiters' neighbors are called next, who testify that Mike was very close to Boone in childhood, and became a law prodigy in high school to follow his father's footsteps. However, Boone recently became extremely violent to his wife Loretta, which caused Mike's relationship with his father to deteriorate. Loretta now testifies that Boone did indeed verbally and physically abuse her many times, with the most recent time on the day of his death. After Boone assaulted her, she went into the bathroom to have a shower. When she came out, she saw Boone was already dead and Mike was standing near his corpse. Ramsey presents a health report as evidence, which proves her injuries. Mike suddenly tells Ramsey that he is now ready to present his testimony. Ramsey is hesitant because he is unsure what Mike wants to say, but Mike threatens to dismiss Ramsey from acting as his defense attorney. Mike affirms in court that his father did frequently assault his mother, but that was not the reason he killed him. Mike reveals that Boone had molested him many times throughout his teenage years, and he wanted to go to a further university to escape from his father. He also states that Boone was angry over this decision and raped him on the flight, and was attempting to do so again before he left for college. This caused him to fight back at his father and led to him stabbing Boone with a knife. The prosecutor requests the flight attendant to be recalled, who insists that she did not notice Mike being sexually assaulted by his father. However, Janelle (with suggestions from Mike) reveals that the flight attendant had an extramarital affair with the pilot, and lied in court to avoid being discovered. This information was enough to discredit her testimony and win support from the jury. After reconsidering Mike's testimony and his mother's reactions, Janelle confronts Loretta outside the courtroom. She deduced that Loretta killed Boone after being assaulted, and Mike was merely trying to take the blame himself to protect his mother. Loretta angrily denies this accusation. Janelle presents this information to Ramsey, but he acts indifferently, stating that all that matters is that this gives him a chance to save Mike. Despite being disgusted by Ramsey's lack of morality, Janelle chooses to remain in court to assist Ramsey in the case. The jury announce their decision: Mike Lassiter is found not guilty of murder. Ramsey congratulates Mike, but Mike asks to speak with him in private. Mike approaches Ramsey outside of court and reveals that he saw Ramsey's watch at the scene of the crime and angrily accuses Ramsey as the one who murdered his father. Ramsey recalls the true events that happened. Loretta was secretly having an affair with Ramsey, and Boone became suspicious of his wife's infidelity. To protect her from further abuse, Ramsey conspired with Loretta to kill Boone and disguise it as self defense. On that day, Ramsey was the one who murdered Boone, but before he and Loretta could tamper with the crime scene, Mike returned home. Ramsey hastily escaped from the Lassiter house, and Mike subsequently planned the series of events to protect his mother. ^ "THE WHOLE TRUTH (15)". British Board of Film Classification. March 24, 2016. Retrieved March 25, 2016. ^ a b c Ge, Linda (July 10, 2014). "Jim Belushi Joins Keanu Reeves, Renee Zellweger in Courtney Hunt's 'The Whole Truth'". thewrap.com. Retrieved July 11, 2014. ^ a b "Jim Klock Joins 'The Whole Truth'". deadline.com. August 12, 2014. Retrieved August 13, 2014. ^ "Daniel Craig Abruptly Drops Out of 'The Whole Truth'". deadline. August 4, 2014. Retrieved October 4, 2014. ^ "ON THE SET FOR 7/07/14: Owen Wilson & Kristen Wiff start relativity armored car project, Mel Gibson wraps on Blood Father". studiosystemnews.com. July 7, 2014. Retrieved July 11, 2014. ^ Banks, Paul (July 2, 2014). "New Orleans courts The Whole Truth". kftv.com. Retrieved July 14, 2014.